The single output ferroresonant design allows for all of its rated output current to be utilized as battery charging current when needed and if the conditions are right. If the branch circuits (lights, water pumps, fans, etc. ), are not being used on a 50-amp ferroresonant converter, for instance, then all 50 of the amps will be available for battery charging purposes. Another advantage is that the ferroresonant type will compensate for variances in the AC line voltages. Some ferroresonant converters mandate a battery be connected into the system in order for full output voltage to be obtained. I'm guessing your existing converter is this type. The disadvantages include poor output voltage regulation. Substantial changes in the output voltage can occur with changes in the output current. In other words, as the RV appliances are used, the output voltage drops significantly resulting in an inappropriate voltage for effective battery charging. And like the dual output converter, charging times can become exasperatingly long. Additionally, ferroresonant converters can utilize the battery as an augmentation if any load so requires. For instance, if when powering a 12-volt electric tongue jack on a travel trailer, the load becomes more than the rated capacity of the converter, the current stored in the battery can be utilized and added to the current supplied by the converter. A dual output converter in the same situation would overheat and either trip a breaker or damage other components. The single output, switching type converter/charger provides a single circuit connected in parallel with the coach battery and the branch circuits. Again, the rated output current can be split between the charging duties and for powering the coach. Similar to a stand-alone 12-volt power supply, these types of converters/chargers are able to power the coach even without a battery in place. Another advantage of this type is that the output voltage regulation is quite good and some models offer a user-defined fixed output level. This results in a shorter charging time when compared to the dual output type or the ferroresonant type, but mandates strict monitoring of the battery charging procedure in order to avoid overcharging the battery. A little of the "automatic" will be compromised with this type. The single output, multi-stage converter/charger is by far the most advantageous. Most all sophisticated, multi-stage charging converters include, or offer as an option, a highly developed monitor panel for measuring battery voltage and current flow to and from the battery bank. 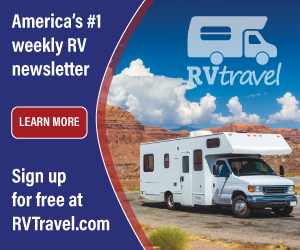 This is a must for the active RVer or full-timer. They employ state of the art charging criteria developed specifically for deep cycle batteries while optimizing the charging parameters by taking into account the battery temperature, the total amp-hour capacity of the battery bank and the type of electrolyte used. Most multi-stage charging converters such have an added benefit of a fourth stage, an equalization charge. This breed of charging converter employs the use of microprocessor controlled power MOSFET technology along with PWM for optimum efficiency and performance. This is the one I recommend, especially if you upgrade which is always an option. 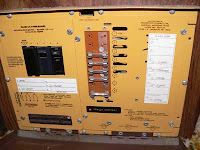 But back to your question....first, reconnect the battery (make sure it's fully charged) and see if the 12-volt equipment starts working again after starting the generator. If they do, you probably have a ferroresonant type of converter and there's probably nothing wrong. If the 12-volt lamps, fans and water pump still do not operate, it may be necessary to dig a little deeper.